Protesters turned their backs to Charles Murray, unseen, during his lecture in Middlebury, Vt., on Thursday. 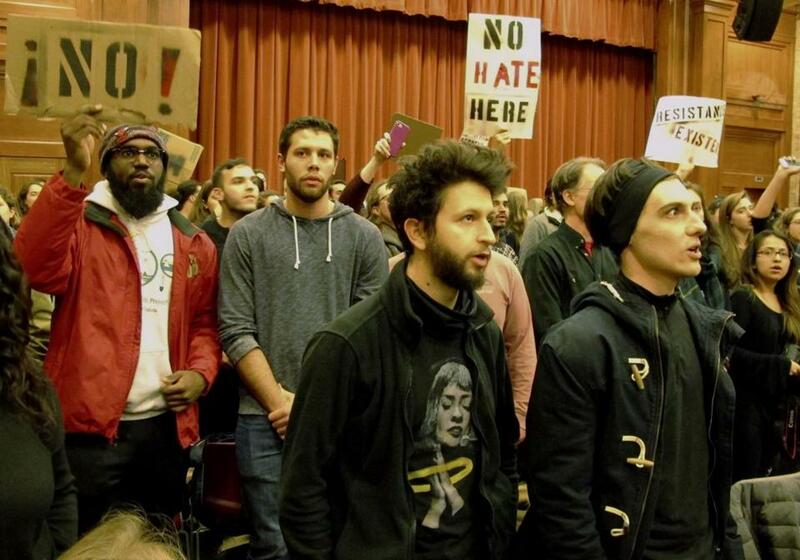 A group of demonstrators at Middlebury College in Vermont “aggressively confronted” guest speaker Charles Murray and a Middlebury professor Thursday afternoon, a skirmish that turned violent and left the professor injured. Murray, a controversial libertarian scholar, and Allison Stanger, a Middlebury College international politics and economics professor, were shoved by protesters as they left the McCullough Student Center, where Murray had given a talk, according to Middlebury College’s president, Laurie Patton. One protester pulled Stanger’s hair and injured her neck. She was taken to a hospital, where she was treated and released. Murray arrived and tried to deliver his speech, but was shouted down, Burger said. As they had planned, administrators then took Murray to a video studio in the same building and broadcast the event online. But some protesters began pulling fire alarms, temporarily shutting off power to the live stream. When Murray finished his speech, he left the building with Stanger and Burger, but was met by a group of protesters who wore bandanas to cover their faces. Burger said he believed they were “outside agitators” who had been barred from the event, rather than Middlebury students. Flanked by security officers, the three moved toward Burger’s car. By that point, more than 20 demonstrators had gathered. One threw a stop sign with a heavy concrete base in front of Burger’s car, and several others rocked, pounded, and jumped on the vehicle. A controversial figure, Murray is best known as the author of “The Bell Curve: Intelligence and Class Structure in American Life” and “Coming Apart: The State of White America, 1960-2010.” The Southern Poverty Law Center describes Murray as a “white nationalist” who believes in the intellectual and moral superiority of white men and advocates for the elimination of welfare and affirmative action. Jacob Geanous can be reached at jacobgeanous@globe.com. Felicia Gans can be reached at felicia.gans@globe.com. Olivia Arnold can be reached at olivia.arnold@globe.com.